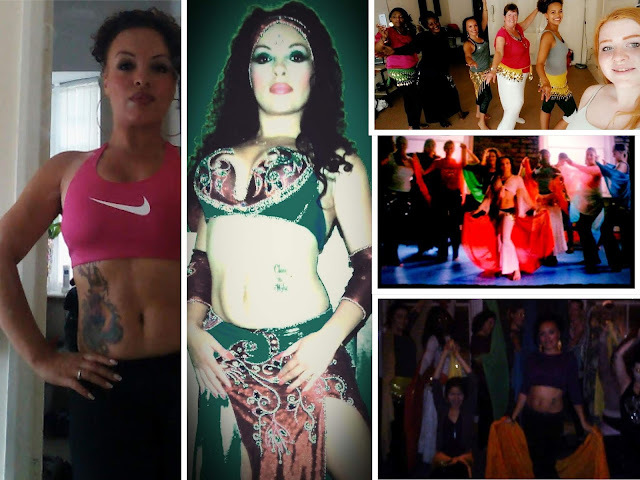 Belly dancing has many health, Fitness and psychological benefits but that doesn't mean any kind of transformation is going to happen overnight. Yes it can be beneficial for those of you wanting to shed a few pounds but attending just one, One hour class a week is unlikely to help. Like most forms of cardiovascular exercise it is important to do it several times a week to get the best benefits. The best advice I can give is why not try attending several classes with different teachers each week. If you have a limited budget practice what you have learned at class for around twenty to thirty minutes per day over three or four days. Incorporate lots of percussive and travelung movements like hip shimmies whilst raising the arms up and down and layered shoulder shimmies whilst traveling in different directions. Buy an uplifting belly dancing music CD and remember to warm up before exercising and cool down afterwards. Don't attempt stretches before your body is completely warmed up. Another idea would be to purchase a belly dance instruction DVD or subscribe to an online belly dance steaming website. Again practice in between attending live belly dancing classes and remember that a DVD or streaming video won't substitute attending a real class. Belly dancing is not only great for abdominal toning it is a dance form like any other that incorporates the whole body. When we practice the pelvic movements that are specific to belly dance (like hip shimmies, hip taks drops and lifts, figure 8s, circles, Undulations, Camels, Belly rolls, Pops & pelvic pulsing) we are working the core muscles (belly, lower back, bum, inner thighs, Pelvic floor) we have better stability, Whole body strength posture & balance which is essential to a healthy body.If your core is out balance or weak the rest of your body will be. The thing I really love about the movements specific to belly dance is how they contract the muscle and stretch out the muscle all on one movement this isolates the mucsle ensuring better benefits meaning a better workout that prevents bulking up of the body keeping us feminine whilst sculpting our curves. Sculpting is what belly dance toning does for us (think of an hourglass shillohette - better core stability & correct body posture when taught and practiced correctly) but remember attending just one, one hour per week won't help.You really have to be dedicated if you truly want to see and feel a difference. Try incorporating various figure of eights, Hip circles, Snake arms, Contemporary snake arms, Hip twists, Hip Lifts and drops and some floor work. Make sure you change the tempo from medium\usual speed through to fast tempo and then very slow tempo. Practice to music where the melody (fluid sounding) is more noticeable with percussive drums in the background. Don't forget to warm up and cool down afterwards. Figure eights, Hip Twists and circles benefits the legs, glutes (booty),Love handles, Waist lower back and belly. Belly rolls and undulations benefit the abdominal, Back and chest muscles. Hip drops and lifts benefit the legs and glutes. Snake arms benefit the arms shoulders wrists hands and upper back muscles. Floor work is a great Workout because we incorporate using our own weight resistance whilst Performing moves in the same category as press ups, sit ups and side planks. Remember to warm up before and cool down after wards. It is also beneficial to eat or drink a good source of protein after any kind of muscle toning exersisers. Around twenty grams per serving which it is about a chicken breast, a bowl of Greek yogurt, A large glass of semi skimmed milk, A protein shake or any other form of healthy protein. Want to try a bellydance fitness class? 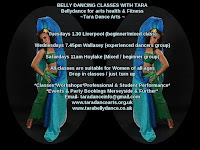 I run belly dance arts & fitness classes with Wirral and Liverpool. Ussually £60 full course or try a class for £5.